It’s day three, and the puppies are all doing just fine. Everyone is eating well, gaining weight, and looking fat and glossy coated – just what you want in a litter. Sailor’s milk is in, and she’s finally huffing a little less as a result. Her appetite is good, and she’s drinking lots of water. She has, however, gone a little bit nuts. Today was the day Sailor woke up and realized she really, really, really loves her puppies. Loves them in an obsessive compulsive, ‘quick get a restraining order’ kind of way. She’s got that glazed over, googly eyed look on her face, and getting her to go outside to pee has become a chore. “Think of all the things that could happen while I’m gone!” you can almost hear her thinking. So, she sits in the whelping box, panting and looking worried, until I lift her up and carry outside, where she pees, spins around the yard checking for stray puppies she might have missed, then returns to the house to check for puppies in the sofa cushions. Reassured she hasn’t left any under there with the spare change, she finally returns to the whelping box in a state of mild panic. Shoving all of the blankets into a nest seems to calm her down a little, until the next mandatory pee break. The last time Sailor went outside, she suddenly flew across the yard, intent on something she’d noticed in a holly bush. 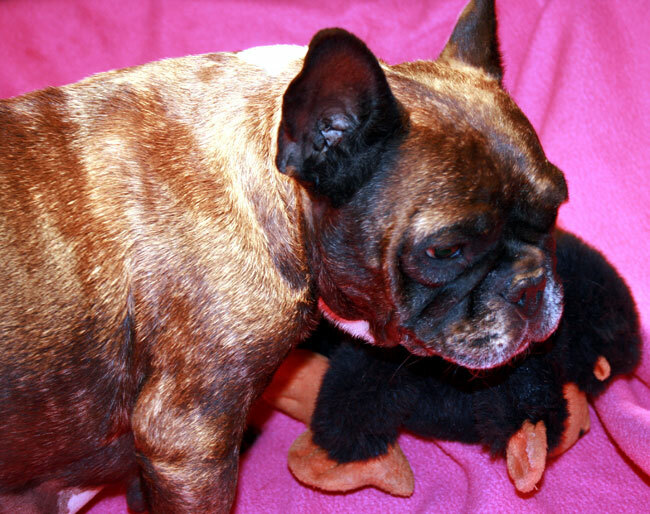 It was Mr. Monkey, Tula’s well chewed on stuffed squeaky toy. 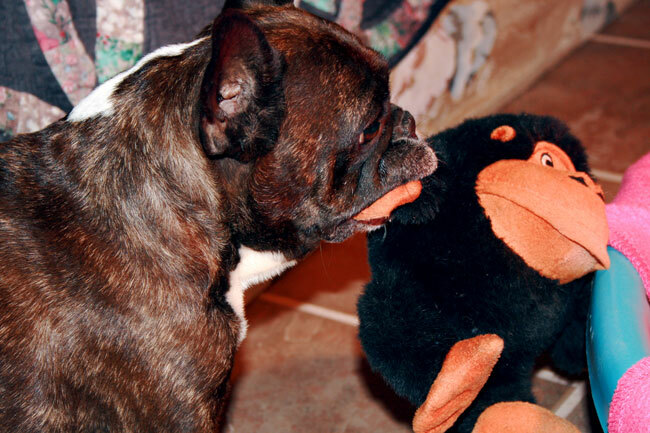 Sailor decided Mr. Monkey was obviously a missing puppy she’d somehow forgotten outside. Picking Mr Monkey up, she flew back to the whelping box, tucked him in with the puppies, and curled around all three of them with a defiant look that seemed to say “What? A girl can’t accidentally leave her stuffed puppy outside by accident?”. Hey, who am I to argue. We’ve now worked out a compromise. When Sailor has to pee, I let her carry Mr. Monkey outside in her mouth. She then brings him back to the whelping box, where I leave him until it’s safe to tuck him away someplace until the next pee break. I just hope the pups won’t be traumatized by growing up in a litter that consists of two puppies, and one stuffed brown and orange gorilla. 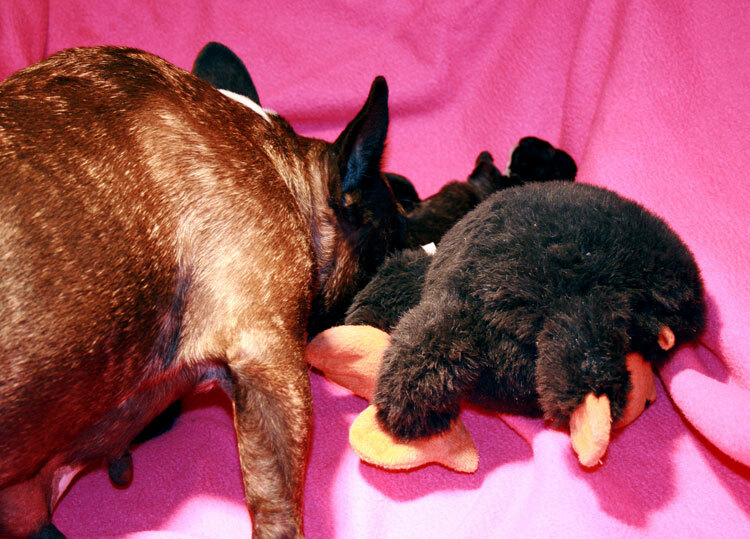 I have to tell you that when Qor comes into season, she also has “stuffed puppies”. every toy in the house is tucked into her crate, the couch and everywhere else you can imagine. I am so enjoying reading about Sailor and her pups! What a great story. How wonderful are canine hormones.